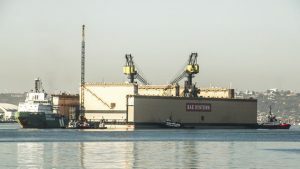 The largest floating drydock in California recently arrived at the San Diego shipyard of BAE Systems. It is 950 feet long. The company has planned a $100 million investment to develop the yard ahead of the anticipated development of the US Navy along the West Coast of the US. The yard was towed in by the Polish tug Terasea Eagle. A team from BAE will take two months completing the final assembly and testing of the dock, after which it will be certified as ready for use. It is hoped to be fully operational by early in 2017, and already the first ship, USS New Orleans, is booked in for servicing. Whilst this is big, the largest floating drydock in the United States is the Vigorous, at 960 feet long. This is based at Vigor Industrial’s shipyard at Portland, Oregon, and has an 80,000-ton capacity. 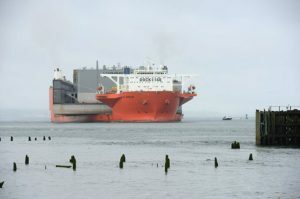 It was designed to meet the requirements of the US Navy’s military standards as well as the American Bureau of Shipping. The drydock was delivered aboard the heavy lift vessel Blue Marlin in 2014.